Peeling paint is seen on an HOV lane in Toronto on Monday, June 15, 2015. TORONTO -- Ontario's government says work will get underway as soon as possible to replace peeling signs marking temporary high-occupancy vehicle lanes in the Toronto region that will be used for the Pan Am Games. The lanes are being set up to help ease traffic congestion during the sporting event which will see thousands of athletes and visitors descend on the city and its surrounding areas. 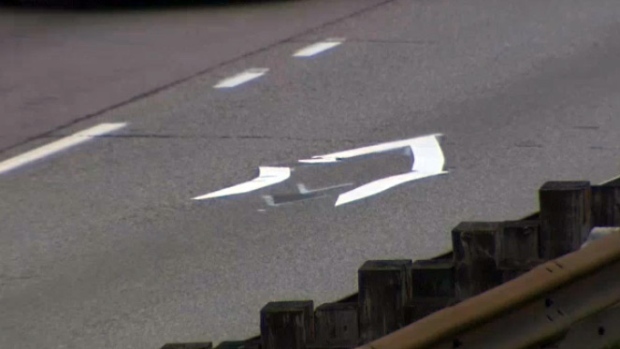 The Ministry of Transportation says its staff noticed "disintegration" of taped white diamond markings on the lanes on the Queen Elizabeth Way through Mississauga on Friday, while problems have also been spotted on Highway 427 between QEW and Highway 401. It says replacement work "will be undertaken as soon as possible" this week, weather permitting, at the contractor's expense. Spokesman Bob Nichols explained that successful installation of the markings requires clean and dry pavement, with recent wet weather not helping operations. He says temporary adhesive tape was used to create the markings on the lanes to help make them easy to remove after the Pan Am Games end. "Painting the diamonds as they are replaced instead of using tape is being considered, but the subsequent obliteration leaves permanent scarring on the pavement," Nichols said Monday. 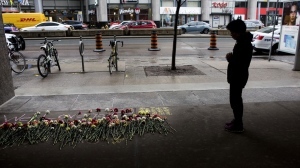 "(We) will monitor the situation and if problems continue, will consider the use of paint." Nichols added that the enforcement of the temporary HOV lanes is based on signs beside the lane and not the pavement markings, but noted that the markings on the roads themselves are an important visual aid. The temporary HOV lanes will be in place from June 29 to Aug. 18, from 5 a.m. to 11 p.m., on all major routes into Toronto. During the Games the lanes will be limited to vehicles carrying three or more occupants, while for the Parapan Am Games, the lanes will be limited to vehicles carrying two or more passengers. Organizers are counting on a 20 per cent drop in traffic in order to prevent significant delays on roads and highways linking the Games' 16 host municipalities. They are urging residents to carpool, take transit, cycle or walk during the Games, and are asking businesses to schedule deliveries at off-peak hours. But critics have argued it's unrealistic to expect residents to leave their cars at home, and predict the Toronto region will be paralysed by gridlock. The peeling highway signs are the latest in a series of Games-related hiccups. Last month, Pan Am organizers had to replace thousands of shirts for Games volunteers after discovering the logos on them may wear away after washing. Nearly 60,000 of the polo shirts were ordered for volunteers and were produced in China by Canadian affordable apparel brand Joe Fresh. Also last month, free water bottles handed out to Games volunteers in a uniform kit were replaced after some reports that the lids leaked. A photograph posted to a Facebook group for Games volunteers showed a bottle allegedly melted in spots after being left in the sun. Toronto and the surrounding area will play host to the Pan Am Games from July 10 to 26. The Pan Am Games will take place from July 10 to 26, and the Parapan Games from Aug. 7 to 15.